In Berlin, Karaoke bars are not just hidden out the back of an Asian restaurant, they are out and proud and waiting for you to bash out your favourite tune in between cocktails! Spending the evening at a karaoke bar is where you are both the entertainment and the audience. Sing live to tracks alone, with a partner or a bunch of friends, it can make such a fun evening to let your inhibitions go and pick up the microphone. 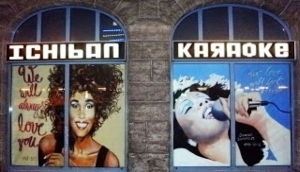 Berliners love karaoke so do as they do, pick out your favourite song and take to the stage!